The first sign that there was something amiss was on May 27th, when our caretaker staff headed to the Mahoosuc and Centennial Trails to do basic trail maintenance. As we reached the ridgelines of the southern Mahoosucs, we found a trail clogged with trees. Tree tops, whole trees, bundles of branches and trunks across the trail. It was slow work. The second sign was the following week, when I headed to Imp campsite to open the site with a caretaker. Right when I passed from the Stony Brook Trail to the Carter Moriah Trail, the same sight greeted me: tree after tree after tree. I was axe-less, but put down my pack, heavy with materials for the campsite, and pulled any tree I could pull off the trail. It was constant. And, because things happen in threes, the third sign came that same day, when I was driving home in Shelburne, and came across the White Mountain Pro Crew, who had had to call their patrol short because there were too many trees. It had taken them five hours to cover three miles. Eventually, a picture was painted: some microweather event had blasted through the northern Carters and the entire Mahoosuc range, leaving behind trails and campsites full of trees. 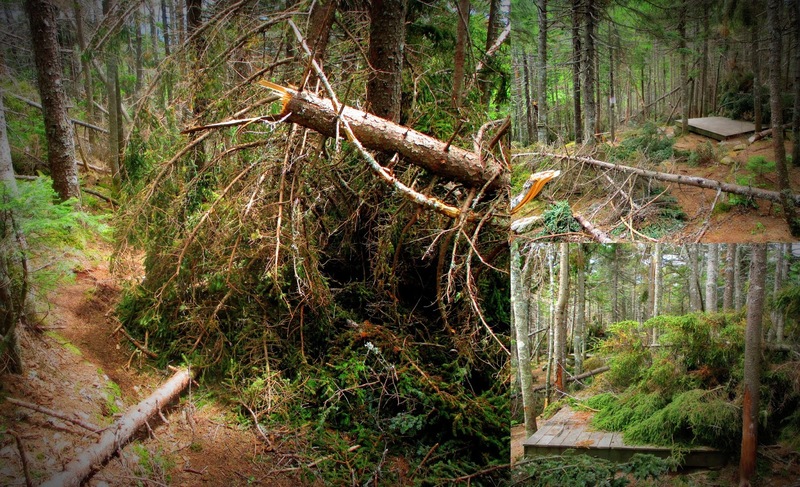 It took the Pro Crew until 9 p.m. to cover the Grafton Loop Trail, it took myself and the Rover a rainy cold day to clear out Carlo Col campsite, and it took the Mahoosuc Rover a full two days to remove all the downed trees from Full Goose Campsite. Every spring we anticipate the serious work of clearing up trails and campsites, of cleaning drainages and breaking down firepits, and of removing trees from trails. The work this year was much more. The pictures here from Full Goose and the Carter Moriah Trail tell the story of what that kind of chaos really looks like. And in our minds? It was just plan messy. As I post today, all of our trails and campsites are cleared, including a non-AMC trail in the Mahoosucs known as the Eyebrow Trail. With basic maintenance behind us, we can move forward into the heavy work of reconstruction and rehabilitation, and, of course, human waste management. Onward.